[Paths,Times,Z] = simulate(MDL) simulates NTRIALS sample paths of NVARS correlated state variables, driven by NBROWNS Brownian motion sources of risk over NPERIODS consecutive observation periods, approximating continuous-time stochastic processes. simulate accepts any variable-length list of input arguments that the simulation method or function referenced by the SDE.Simulation parameter requires or accepts. It passes this input list directly to the appropriate SDE simulation method or user-defined simulation function. [Paths,Times,Z] = simulate(___,Optional) adds optional input arguments. The stock currently trades at 105. The stock volatility is 30% per annum. The option strike price is 100. The option barrier is 120. The risk-free rate is constant at 5% per annum. The goal is to simulate various paths of daily stock prices, and calculate the price of the barrier option as the risk-neutral sample average of the discounted terminal option payoff. Since this is a barrier option, you must also determine if and when the barrier is crossed. This example performs antithetic sampling by explicitly setting the Antithetic flag to true, and then specifies an end-of-period processing function to record the maximum and terminal stock prices on a path-by-path basis. Create a GBM model using gbm. Perform a small-scale simulation that explicitly returns two simulated paths. 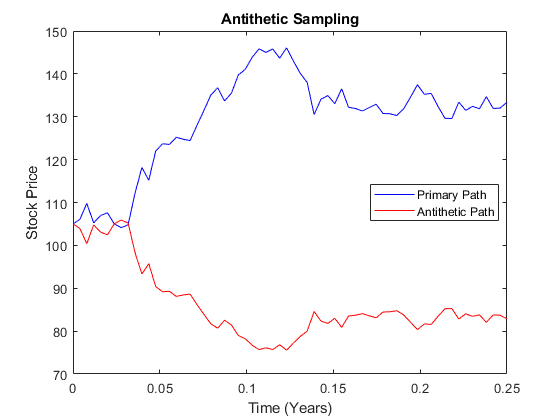 Perform antithetic sampling such that all primary and antithetic paths are simulated and stored in successive matching pairs. Odd paths (1,3,5,...) correspond to the primary Gaussian paths. Even paths (2,4,6,...) are the matching antithetic paths of each pair, derived by negating the Gaussian draws of the corresponding primary (odd) path. Verify this by examining the matching paths of the primary/antithetic pair. 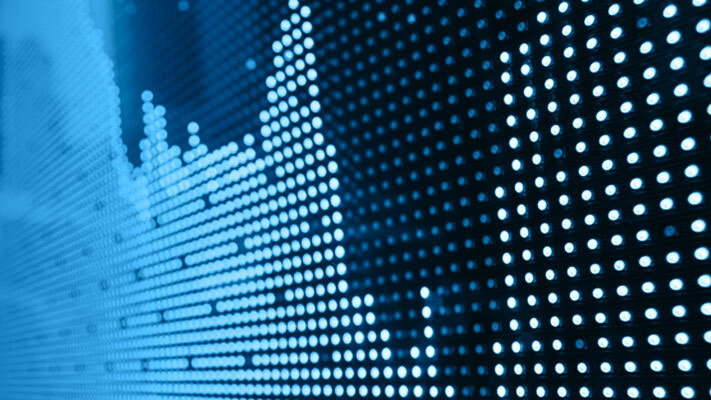 To price the European barrier option, specify an end-of-period processing function to record the maximum and terminal stock prices. This processing function is accessible by time and state, and is implemented as a nested function with access to shared information that allows the option price and corresponding standard error to be calculated. For more information on using an end-of-period processing function, see Pricing Equity Options. Simulate 200 paths using the processing function method. Approximate the option price with a 95% confidence interval. Any variable-length list of input arguments that the simulation method or function referenced by the SDE.Simulation parameter requires or accepts, specified as a variable-length list of input arguments. This input list is passed directly to the appropriate SDE simulation method or user-defined simulation function. Three-dimensional time series array, consisting of simulated paths of correlated state variables, returned as an (NPERIODS + 1)-by-NVARS-by-NTRIALS array. For a given trial, each row of Paths is the transpose of the state vector Xt at time t.
Observation times associated with the simulated paths, returned as a (NPERIODS + 1)-by-1 column vector. Three-dimensional time series array of dependent random variates used to generate the Brownian motion vector (Wiener processes) that drove the simulated results found in Paths, returned as a NTIMES-by-NBROWNS-by-NTRIALS array. NTIMES is the number of time steps at which the simulate function samples the state vector. NTIMES includes intermediate times designed to improve accuracy, which simulate does not necessarily report in the Paths output time series.